Unprecedented access to real-time market data could permanently change the way CRE professionals work — but not without meaningful integration. Given what’s at stake in a commercial real estate industry that’s worth trillions of dollars, probability and instinct alone are too fallible to drive meaningful business decisions. And while the rise of big data may indeed be an arbiter of industry-wide transformation, it must be implemented in a way that saves time, increases output, and informs strategic investment. The good news is that today, the tools CRE professionals require to grow business are both available and affordable — they need only reach out and seize the opportunity. In many ways, CRE has always been data-fueled. Long before the rise of smartphones, tablets, and even Excel spreadsheets, industry success depended on a broker or investor’s capacity for encyclopedic knowledge — but even the most analytical human brain has limits to how much information it can collect, sort, and reference. And while the days of door-to-door house calls may feel laughably archaic, the phone calls, mass email campaigns, and spreadsheets of today are simply a new iteration of that same inefficiency. Unless your business is prepared to hire a team of trained analysts to not only collect but systemize available data for speedy retrieval, that painstaking work falls to appraisers, brokers, and developers themselves. The last 24 months have brought about a wave of CRE data platforms designed to streamline and optimize the way these professionals access and organize property data. My own company, Reonomy, is one of them. These platforms provide instant access to key data points like owner contact information, debt history, NOI, and cap rate — all within the context of a single streamlined user experience. The leading platforms provide users with a combination of public-source information and proprietary data, empowering investment firms and brokerages to make strategic, forward-thinking decisions with the help of real-time market insights. But our technology isn’t here to replace living, breathing CRE professionals. We can’t do that, and neither can our competitors. 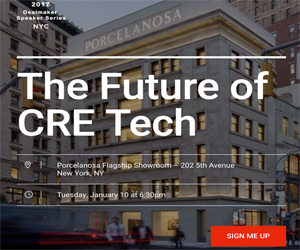 Yes, the right CRE platform has the power to make investments less risky, growth easier to predict, and the appraisal process more straightforward. But without industry veterans to tailor and implement those capabilities, CRE data platforms lose their efficacy. It’s through the lens of past experience that CRE professionals can best leverage the capabilities of big data, applying the natural segmentation that dictates their job function to identify the most relevant data sets within the sea of available information. For example, an investor could turn to her 20 years of experience to predict that a certain neighborhood in Chicago will be the next to take off. She could then harness the power of big data to acquire crucial details (e.g. debt, RSF, etc.) for every commercial property within that zip code. Conversely, a broker in Santa Fe might have realized by now that properties valued between $500,000 and $1 million sell faster than all others in her area. The right platform could put a comprehensive list of properties fitting that criteria in her hands in a matter of seconds. It’s easy and sensible to let big data lead decision making, but that’s different from letting it make big decisions for you. It’s up to your finely tuned instincts to drive the impactful use of this information — CRE data platforms simply amplify the extent to which those insights grow your business. Richard Sarkis is CEO and Co-Founder of Reonomy. Since founding the company in 2013, Sarkis has led Reonomy through a tremendously successful platform launch in New York City and been instrumental in raising $18M in venture capital. Under his leadership, Reonomy's business has doubled in size and is poised to expand nationally in 2017. An avid entrepreneur, Sarkis has launched and run numerous businesses including an international arbitrage textbook company, a college marketing network, and an offshore technology outfit. He was most recently an Associate Partner at McKinsey & Company specializing in Financial Services before deciding to return to his entrepreneurial roots. Reonomy turns complex commercial real estate data into accessible insights for developers, appraisers, and analysts. Drawing from public-source information and proprietary data sets, we provide innovative solutions and insights that help CRE professionals navigate a multi-trillion-dollar marketplace with simplicity and ease. Beyond technology and real estate, we’re interested in people. That’s why we’ve created a tool that empowers our users to make faster, informed decisions.